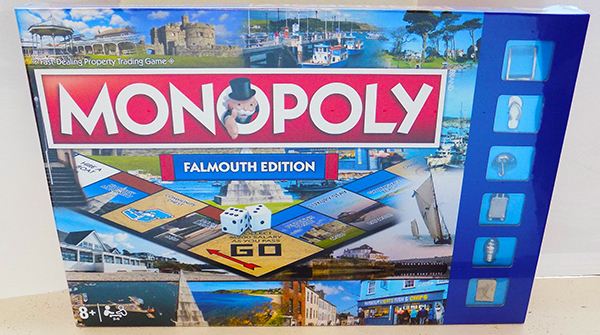 The great property trading board game,Monopoly,now finds its home in historic Falmouth! 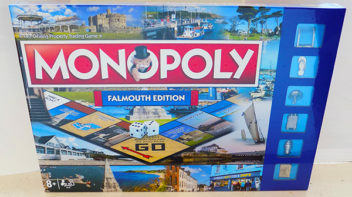 Featuring Falmouth’s fascinating maritime history to the town’s fab dining options and festivals. Pass GO and begin your journey up Jacob’s Ladder,travel around town,then wind down on Gyllyngvase Beach. You could be the owner of your favourite place in Falmouth. Tour Falmouth for the hottest properties:sites,annual festivals and local utilities are all up for grabs. Invest in beach huts and hotels, then watch the rent come pouring in! Choose your counters from; sunglasses, palm tree, suitcase, flip flop,umbrella(or is that sunshade!) and ice cream! Age 8 yrs or above. 2-6 players.